Powered up the grill a few days ago and cooked a couple of nice steaks. I rubbed the steaks with Cahoots House Rub and let them sit in the fridge for an hour or so before I slapped ’em on the grill. 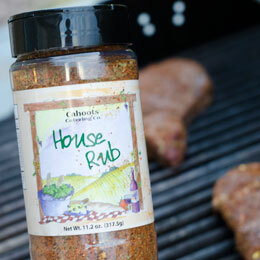 Cahoots House Rub is a seasoning blend with no MSG (which is great for me since MSG gives me headaches), no sugar and no fillers. The seasoning comes in an 11.5oz bottle which costs $7.95 via the Cahoots Catering web site. The steaks tasted great, very juicy and flavorful but not too overboard. I did them just right on the first try.